Great design is as much about function as it is form. Good function often requires that we give our four-legged family members as much or more consideration as all other family members combined. Nothing comes between our dogs and ourselves, but chewed–up cushions, soiled carpets, hair–covered upholstery, and odors (eek!) can make sharing space under one roof more challenging. The love of a pet doesn’t have to keep you from having a stylish and beautiful home, especially with some of the new products on the market today. Below is our list of things to consider for making a home pet friendly and stunningly designed! Stone, laminate, concrete, and ceramic tile are by far the most durable and easiest to maintain, especially with a new puppy or an elderly pet having frequent accidents. Hardwood is also an excellent choice, but over time it may show more wear from claws. Rugs have come a long way in durability and ease of care. There are beautiful indoor/outdoor versions that can actually be hosed down outside, then brought back in looking like a high-end wool rug. Highly patterned rugs in wools and cottons or synthetic blends are much more pet friendly than natural fiber (sisal) rugs that can show every stain. Believe it or not, hand knotted oriental rugs have a long history of coexisting with our furry friends. The patterns hide stains, and the wool can be cleaned. Carpeting comes in stain resistant, man-made fibers, but it does require immediate attention when accidents happen. A more practical option is the use of carpet tiles; they come in all styles and colors and are much easier to replace one tile at a time rather than a whole room of carpet. 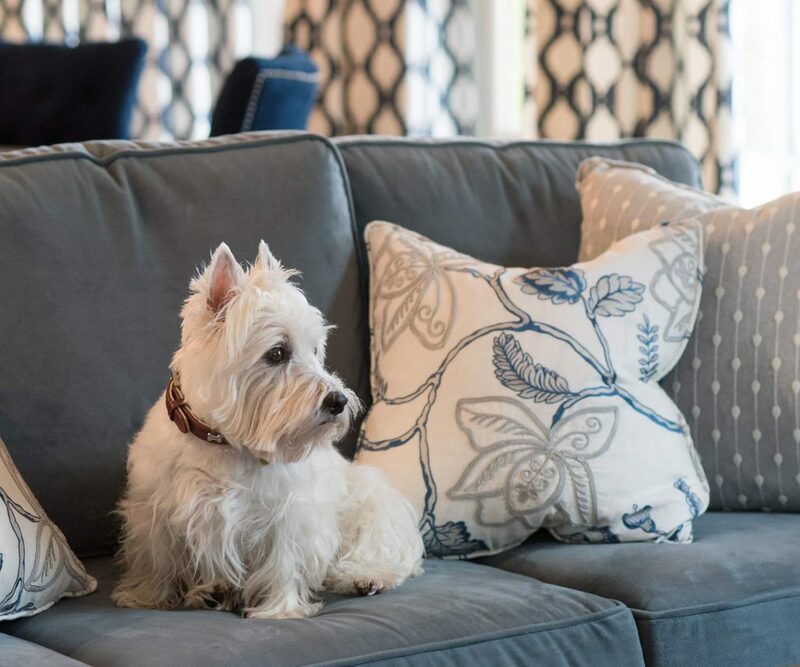 If you truly live right with your pets (meaning they have no boundaries), then the selection of the appropriate upholstery becomes a high priority in your design criteria. Leather and microfiber are always great choices – easy to clean and extremely durable. However, leather can be pricey, and microfiber might not meet the standard your design eye requires. Fortunately, there are some incredibly beautiful fabrics that pass the dog durability test! Indoor/outdoor fabrics have come so far that no guests would realize they’re not sitting on the finest custom upholstery. In addition, Crypton fabrics are nearly indestructible and come in a broad range of colors and weaves. If your best buddy also shares your bed, go for washable fabrics and simple bedding. Sheeted duvets and washable coverlets can be the base of a fabulous bed. Add a punchy pillow or invest in beautiful fabrics for the draperies to finish the look.